NOW Foods Creatine Powder is a supplement that is popular among athletes, bodybuilders and anyone who wants to get lean, strong or more muscular. Creatine is also effective at providing you with additional energy for workouts, particularly if you do intense exercises that require bursts of energy, such as football, basketball, weightlifting, swimming and many other sports. Taking creatine as a powder is convenient and allows for fast absorption by the body. 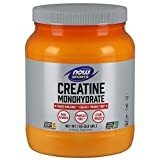 NOW Foods Creatine Powder, which comes in a 2.2 pound container, lists for $29.99 but is available on Amazon for $19.47. Brain Supplement -Creatine is a supplement that helps the brain as well as the muscles. Supports Faster Recovery -Taking this supplement can help you recover more quickly from workouts. Speeds Up Healing -There is evidence that creatine can speed up healing time for bone injuries. NOW Foods Creatine Powder is a supplement with many benefits. Creatine has long been popular among athletes and bodybuilders due to its ability to provide energy, speed up recovery time and support muscle growth. It has many wider uses as well. Athletes in sports that require speed and fast energy find that creatine can improve their performance. For example, a basketball player who wants to be able to jump faster and higher or a runner who wants to start off a race with good time can both benefit from creatine. Due to its effect on the brain and concentration, creatine can also be useful for people who want to improve their productivity and performance at work or school. There is evidence that this supplement improves memory and concentration, which can be valuable in any number of situations. Creatine monohydrate is a safe supplement that occurs naturally in the human body. It helps the body store energy for later use. Creatine is found in many animal-based foods such as meat and fish. It’s difficult, however, for the average person to consume sufficient quantities of creatine to make a noticeable difference in performance. That’s why a supplement of this kind is so convenient. NOW Foods Creatine Powder is a supplement that mixes easily with water. This is a pure supplement with no additives such as sugar, wheat, soy, yeast or artificial colors or flavors. It’s also a vegetarian and vegan-friendly product that does not contain animal products. Since this product is pure creatine, it does not have any particular flavor as many other supplements do. Creatine, however, is fairly tasteless, so most people are not put off by the taste. Many people who have used this supplement report having more strength and energy. Because creatine supports muscle growth and fat loss, it can be helpful for either bulking up or slimming down. To get maximum results, of course, it’s also necessary to exercise regularly. While creatine is a safe and natural supplement, some people report side effects. These may include fatigue, nausea, diarrhea, anxiety and stomach upset. Side effects, however, are rare. Creatine is not, however, appropriate for everyone. Physicians advise that people with diabetes, kidney or liver disease should not take creatine. People who are taking medications that affect blood sugar should consult with their doctors before using creatine. Women who are pregnant or nursing should also avoid it. Some users of this supplement complain that they don’t like the taste. Creatine does not have a strong flavor, so it’s likely that such users are accustomed to energy drinks or supplements that are highly sweetened or flavored with chocolate, orange or another popular flavor. In general, taste is not an issue for most people. Finally, one issue that some users of creatine notice is that they observe dramatic benefits at first but that these level off after a certain amount of time. This is not actually a problem, as this is a normal phenomenon for people who begin exercising and using supplements. Usually, the most extreme gains are at the beginning. Creatine can continue to be beneficial, but it may become more subtle after a while. However, some people are disappointed when they don’t continue to enjoy such dramatic improvements. 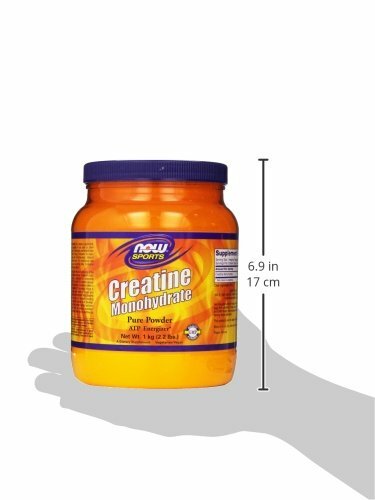 NOW Foods Creatine Powder is a supplement that can be very helpful for anyone who works out or who wants to improve performance at a certain sport. It can also help in other areas, such as productivity and concentration. This creatine supplement comes in a convenient powder form. If taken as directed, it’s safe for the majority of people. As mentioned, there are certain contraindications for people who have chronic illnesses, who are on certain medications or who are pregnant. Aside from this, however, the product is safe and the majority of users don’t have any adverse side effects. NOW Foods Creatine Powder has the advantage of being a natural supplement without any additives. Unlike many energy drinks and other products taken for energy, it does not have sugar, caffeine or artificial stimulants. Anyone who is committed to improving their performance or level of fitness can potentially gain many benefits by taking NOW Foods Creatine Powder.